The National Institute of Hematology and Blood Transfusion yesterday gave awards to 15 teams and 12 individuals that have voluntarily donated blood. 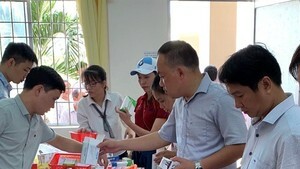 President of the Institute Bach Quoc Khanh said that the award-giving aims to show gratitude to contributions of leaders and managers and outstanding teams and individuals in the voluntary blood donation for years. As of November, 2018, the institute has received more than 320,000 blood units inclusive of over 317,000 blood units from voluntary donors. In 2019, the institute expects to receive 350,000 units of blood. Mr. Khanh said to have 350,000 units of blood, more contribution of team and individuals is needed to improve the movement of blood collection. Head of the institue's blood encourage and collection division Dr. Ngo Manh Quan said that to encourage voluntary blood donors to give blood more regularly, the Ministry of Health has lately green-lighted to provide free tests including blood analysis, kidney and liver’s function and scan to donors.